Hakea bucculenta is a large shrub up to 4 metres high with linear leaves up to 150 mm long x 3 mm wide. The species is similar to H. francisiana and H. multilineata and all have fairly similar cultivation requirements. 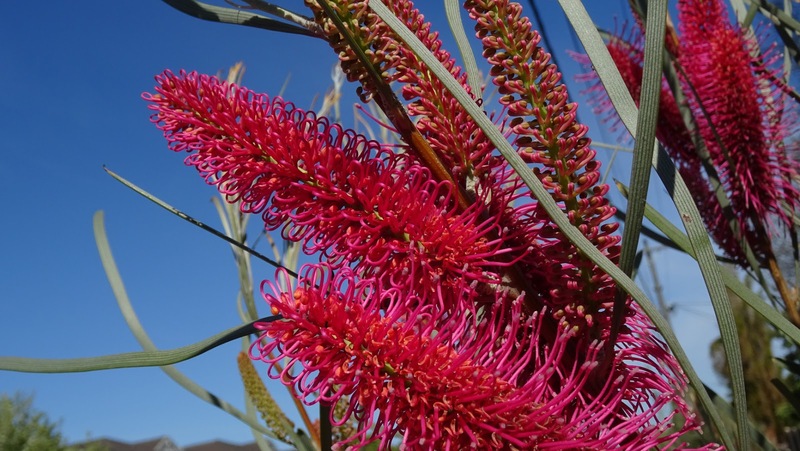 They all belong to the Proteaceae family. The flowers of H. bucculenta occur in large racemes about 150 mm long which are seen in the leaf axils in winter and spring. The flower colour is orange-red. Although the flowers occur within the foliage, the open habit of the plant means that they are well displayed, never failing to attract attention. Flowers are followed by woody seed pods about 20mm long containing two winged seeds, the usual number for all Hakea species. The pods do not shed the seed until stimulated to do so by environmental conditions (eg after a bushfire). This species has been in cultivation for many years but is mainly suited to areas of low summer humidity. In humid areas it can grow successfully for some years but may collapse overnight. Grafting (see below) is recommended for these areas. The species is tolerant of at least moderate frosts and the flowers are attractive to honeyeating birds. The species grows and flowers best in an open, very well drained, sunny position but it will tolerate some shade. Hakea bucculenta is easily grown from seed. Cuttings may succeed but these may not be particularly easy to strike and often do not produce a strong root system. Grafting of the species onto the eastern species H. salicifolia has proved to be very successful and has enabled the plant to be grown in previously unsuitable areas. Grafted plants are now appearing in specialist Australian plant nurseries in eastern Australia. This tree is becoming a very popular and attractive street tree in Melbourne. Very interesting. They do look somewhat similar to bottle-brush plants, which grow in California but can't take any frost, so not in Seattle. Cute flowers! Wonderful and the color I like a lot! Unfortunately I do not know this plant! Pretty colors! I don't think I've ever seen one of these. Beautiful shot of hakea with blue background. Such a beautiful blossom.. and so very informative... Thank You for sharing..